How time fly’s! In 2006, Blastrac opened a production, sales & logistics branch in Poland. Over the 10 years, the facility has evolved and grown in size and is now more developed and equipped to deal with the increasing sales all over the world. To celebrate this anniversary, Blastrac Poland organized an Open Day on the 22nd of September. 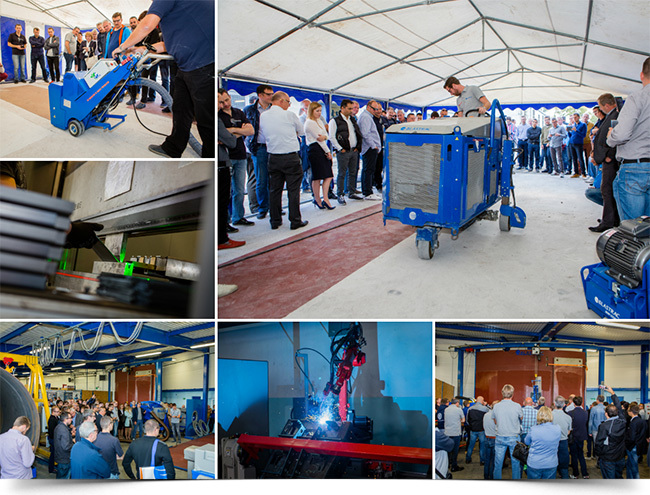 More than 100 customers from Poland, Ukraine, Czech Republic, Estonia, Lithuania and more took part in this celebration, they visited the facility and saw our new products & innovations. It was a really successful event, thanks to the large number of visitors and perfect organization. Demonstrations were held throughout the day showcasing our different techniques, solutions & applications : shot blasting, steel blasting, grinding, scarifying, stripping and dust collection systems. Moreover it was the opportunity for Blastrac to introduce some new machines, such as the new remote controlled single disc grinder BG-250RS, the new vertical steel & concrete shot blaster 200VMB and the vertical steel blaster 900VMB mainly used on windmill turbines. As usual, our team of experts was present to answer any questions and provide any necessary advice.